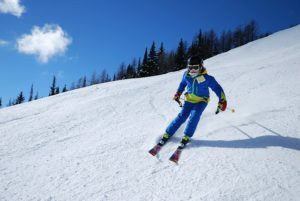 Skiers and snowboarders heading to the slopes this Spring Break should be aware that most injuries happen in the afternoon when fatigue sets in and your legs are tired from morning runs. Other factors that may lead to an injury on the slopes include skiing/snowboarding recklessly or beyond your ability, and failure to obey warning signs or directions posted on the mountain. The most serious type of injury from skiing is a head or spinal cord injury that could result in paralysis or even death. Wearing a helmet can make all the difference, no matter your age. Experts say protective headgear lowers your risk of a head and neck injury by 43%! Other common skiing and snowboarding injuries include ACL tears, shoulder dislocations, and hand/wrist or ankle fractures. Wear properly fitting equipment that is not too loose or tight, along with a secure helmet. Always know your limits and capabilities and stay in control by not going too fast. Pay close attention to all weather warnings and avoid skiing at dusk or nighttime when visibility can be poor. Never ski alone and always let someone else off the mountain know when to expect your return. Stop skiing as soon as you feel tired, hungry, or dehydrated. Follow all directions for right-of-way traffic designated by signs or ski patrol, and always be aware of the proximity of skiers around you. Dressing in warm, breathable layers of clothing and wearing sunscreen are also important to your heath and safety when skiing. If you or someone you are with are injured on the slopes, seek medical attention immediately. For other sports injuries or to schedule an appointment with one of our hand and wrist surgeons, knee surgeons, or shoulder specialists, please visit us online anytime.